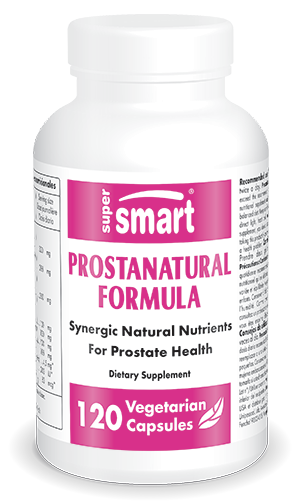 ProstaNatural Formula is a comprehensive and meticulously-formulated supplement, aimed at men over 50. It contains several exceptional nutrients which help improve urinary and prostate function, such as extracts of saw palmetto and nettle root, for unrivalled and measurable results. What is in ProstaNatural Formula? Saw Palmetto extract (Serenoa repens) standardised to 45% free fatty acids. Saw palmetto is a South American plant historically used in traditional Native American medicine to treat a wide range of urinary problems. It became popular again in the 20th century in the form of supplements aimed at men over 50. Research is ongoing to try and better understand the potential effects of saw palmetto’s free fatty acids (oleic, palmitic, lauric and myristic acids) and sterols (most notably beta-sitosterol). In April 2016, the European Medicines Agency, an agency of the European Union, concluded that extract of saw palmetto fruit could be used to treat the symptoms of benign prostatic hyperplasia as well as various urinary problems (such as difficulty urinating or the frequent urge to urinate). They based their conclusions both on its traditional use and on a selection of clinical studies (for more information: Saw palmetto fruit EMA/823974/2015). Nettle root extract (Urtica dioica). Nettle is a perennial herb known for encouraging renal elimination (2). African plum tree extract (Pygeum africanum) standardised to 2.5% beta-sitosterol and soy extract standardised to 40% beta-sitosterol. Pygeum bark has been traditionally used in Africa and imported into Europe and North America since the 18th century. Like soy, it contains large amounts of beta-sitosterol. Flower pollen extract (100mg) and extract of Collinsonia canadensis root (also known as rich-weed). Unlike the pollen collected from hive entrances, flower pollen is machine-collected direct from flowers, reducing the risk of allergy. DIM is the conversion product of indole-3-carbinol, an active compound with significant potential, produced when cruciferous vegetables such as broccoli and Brussels sprouts are digested. 4.5mg of zinc, 200IU of vitamin E and 80mcg of selenium. ProstaNatural Formula is enriched with selenium, which supports healthy spermatogenesis (4), vitamin E, and zinc, which helps maintain adequate testosterone levels (5). These natural active principles are combined in a single vegetarian capsule for unrivalled results. Benign prostatic hyperplasia is characterised by an increase in the size of the prostate. This results in abnormal pressure on the bladder and causes problems with urination (intermittent flow, pain, frequent need to urinate, dribbling at the end of urination, weak urine stream, bladder stones, urinary infections …). It’s estimated that over 50% of 60 year-old males are affected, rising to almost 90% at the age of 90 (6). The causes are not yet fully established, but it’s known that testosterone and certain of its derivatives play a role in prostate enlargement - it can reach seven times its original size (around 20g in weight). What other measures can be combined with taking ProstaNatural Formula? remain as active as possible : physical inactivity increases retention of urine in the bladder. Benefits can be felt from as early as the first few days of supplementation, but it takes several weeks’ use to fully appreciate the effects. Which other supplements combine well with ProstaNatural Formula? Alongside ProstaNatural Formula, you might also find the following supplements of interest: Prosta-Friendly, a natural, cranberry-based formulation, as well as a top-of-the-range extract of Saw Palmetto, to boost the effects of the free fatty acids in ProstaNatural Formula. Question EFSA-Q-2008-4650 – Application Numbers 3934 & 4624, Claims pending. ID 2346: “Urtica dioica - common name: Stinging nettle” and “Renal Elimination / Organism draining” ARTICLE 13.1, Claims pending. Safarinejad MR, 2005. Urtica dioica for treatment of benign prostatic hyperplasia: a prospective, randomized, double-blind, placebo-controlled, crossover study. J Herb Pharmacother, 5, 1-11. EFSA Opinion reference 2009;7(9):1220, Art. 13(1). EFSA Opinion reference 2010;8(10):1819, Art. 13(1). Other ingredients :Acacia gum, rice flour.